I mentioned these in the "The Person Under Me" thread and received requests and private messages for the recipe, so here goes. I only make these at Christmas as the cooking/wrapping is a lot of work, but they are worth it. If you haven't made candy before, this is a good recipe because I have never had these not turn out. 2 cans (I'd say it was 8-10 oz, but I don't have it in front of me.) cashews pieces, salted. Really, however much you want. I like mine buried on the bottom of the caramel for the most part. Line 2 jelly roll pans with aluminum foil, wrapping around the edges so it is secure. Butter evenly all over or you will never get the caramel off of it. Shake your jar of nuts to shake up the salt off the bottom, then spread a layer of nuts across the 1st pan and about 1/2 way the second pan. In a heavy bottomed, large saucepan, melt butter, stir in brown sugar, sweetened milk and corn syrup. Mix well. The butter won't all mix in at this point. It's OK. Clip on candy thermometer so it doesn't touch the bottom. A note to those who haven't made candy....the temperature will hang out at 225/230 for what seems like a long time and then it will go up quickly, so you have to watch it. Remove from heat, stir in vanilla. Be careful because it will spit when the vanilla hits it. Quickly pour mixture over cashews to cover. 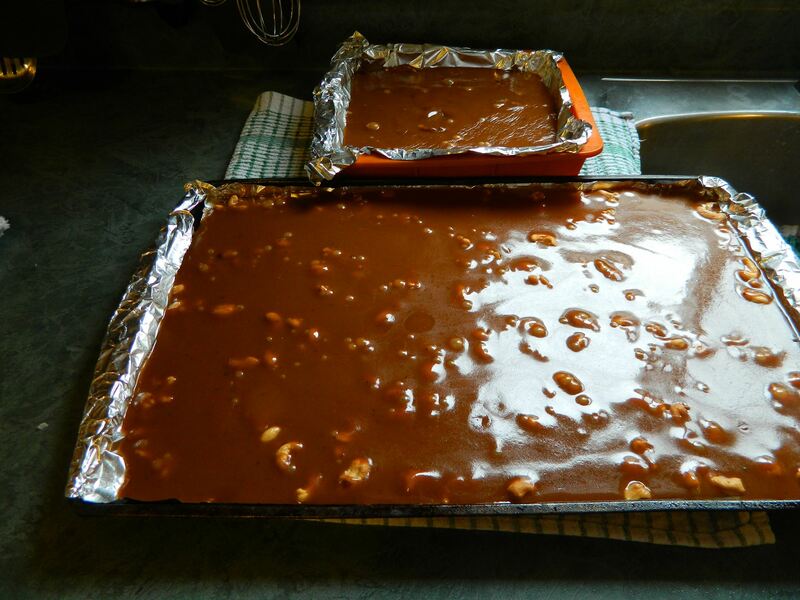 If it seems like you have extra, pour that over one end of the extra pan to keep it thick enough to make more caramels. You can see from the picture below that I got about a pan and a half, although I didn't have an extra jelly roll pan so I used a cake pan. Don't try to scrape the bottom of the pan really hard...there will be darkened bits on it and it will just make your caramels unattractive. Immediately put hot water and detergent in your pot along with your utensils so the caramel doesn't harden on them. Cool and cut into 1" squares. I wrap them in candy foils that I get from the cake decorating store (minus the papery piece that sometimes comes with them.) But, I've also used cut up pieces of aluminum foil. I usually let them set a couple of days, uncovered before I start to wrap them. This seems like a lot of instructions, but it is quite an easy recipe. As a chef, I tend to give a lot of detail. ​Everything is better with butter! Yummy! I think the detail with your instructions is very helpful. Oh that looks delicious! Will be saving this and hopefully find time to make a batch soon! Watson, no reason you can't use a different nut, is there? Thanks for the recipe. I am going to give it a try. Yum. I will try these this Christmas as gifts. That looks yummy. I make “Roswell Fours”. Much the same but dipped in chocolate and pecans rather than cashews. It is a bit of work but fun to gift. Susie, I don't see why you couldn't use different nuts. Just make sure the pieces aren't too big. These look positively yummy! I'll give them a try this year. Thanks for posting. Looks so yummy! Thanks for the detailed recipe. Thanks for the recipe. I think I might try these and when wrapped individually put them into a pretty jar and give to neighbors. I was one of the ones that PM'd you. Thank You so much for taking the time to share this recipe . It sounds so good. I love making new Christmas candies and cookies. Oh my those look decadent and I LOVE cashews and chocolate and the caramel. HAS to be good. Thank you for this recipe! I'm excited to try it. Does anyone know how to bookmark a post so you can find it again? I want to try it with pecans, ooh or macadamia nuts. My mouth is watering just looking at that goodness. Will have to try this one. Oh, I will have to add these to my candy making this year! Always fun to try something new. Thanks for posting such a detailed recipe. Watson, I showed this to my husband, who is a food chemist and a serious foodie. We printed it out and he told me that the recipe is almost identical to his popcorn balls. They are so good they should be banned from the house! They are seriously to die for. We're going to make your recipe for the kids- can't wait! Thanks again. I adore popcorn balls. Haven’t had in a long time. Looks delicious! I wish we had a smell button here on QB. This is a definite recipe that I am going to try this year. My recipe is similar. I use an 8 x 8 buttered silicon pan . Caramels pop right out. Also warp in wax paper pieces. Chris...I've never seen those. I would still butter it. Eisy.... A silicone pan would be great for these. I'd be hesitant to wrap these in waxed paper. Maybe it would work fine but I think I'd stick with foil, myself.